(Nanowerk Spotlight) Not surprisingly, it has been scientists in The Netherlands - a country that has long been conducting large-scale and long-term field studies on the benefits of certain plants to mental and physical health (scientists refer to this effort as the “great coffee house smoke screen studies”) – that have come up with a nanotechnology discovery that could well revolutionize many consumer products from food to toys. In a report released today, April 1, the Dutch scientists report that a nanoparticulate substance found in Cannabis sativa, also know as marijuana, has an amazing ability to kill fat cells in the human body. Splifferenes' amazing physical and chemical properties make them suitable for a wide variety of industrial applications. For instance, they are water-soluble and therefore can easily be added to all kinds of food. Their physical toughness and high melting point means they can be applied in nanofabrication techniques like atomic layer deposition or spin-coating and applied as an ultra thin, only one atom layer thick coating to any product. 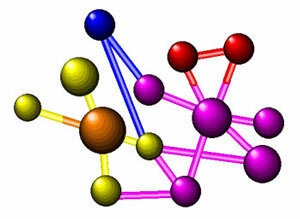 Molecular structure of splifferenes. This image shows the actual colors under an electron microscope. As far as physiological implications are concerned, Splifferenes start their beneficial work immediately after they get into the bloodstream. Basically, that means that as soon as you drink, chew, smoke or lick any substance that is enriched with splifferenes, your body starts destroying fat cells – so effectively you will begin loosing weight immediately. Hoping to ride an early wave of commercialization, the Dutch research group has already filed for patent protection and registered the trademark ”Royal Spliffmeister Edition” for a range of planned products. An early adaptor of emerging technology, the adult industry is jumping on the commercial opportunities that splifferene coatings could offer for adult toys. Firms are falling over themselves in securing licensing rights for the new coatings, and licking their lips in anticipation of a new generation of nanotechnology enabled toys. The hot new industry’s insider website Nanofetish.com reports that a prototype pocket rocket called “Deep Coat” is the first product using a strawberry flavored splifferene thin-film coating. Tom Peeping, the site’s editor, is convinced that nanotechnology will quickly penetrate all areas of adult entertainment paraphernalia. “Can you imagine” he says, “all these gorgeous stars in our industry never having to go on a diet again? We have calculated that during an average workday with the usual activities, an actress would consume enough of these nano thingies to burn off an extra 2,500 calories!” He also announed the first movie featuring splifferene products – "Thong with a Bong" – to be released in the summer. Moving over to the neighboring film industry, Hollywood is abuzz with gossip about which stars already have undergone nanosculpting. This experimental new cosmetic procedure uses subdermal injections of concentrated splifferene solutions to eliminate undesired body fat anywhere on the body. “Has she been nano’d?” is has become an often heard question at LA parties these days. Since it leaves no scars and works within minutes this treatment appears to be the holy grail that aging film stars having been waiting for. And you know that once Hollywood stars have adopted something it won’t be long before it hits the mainstream. The nanotechnology community is so enthusiastic about possible revolutionary breakthrough products that for instance the Project for Exposing Nanostuff (PEN) has announced a new category called “NanoHigh” in its nanomaterial database, which just celebrated its 50,000th entry (an amazing shape-shifting diaper with super soaky and aroma enhanced nanofiber coatings and thin-film based acoustic alarm). The NanoHigh category will include mood enhancing and stimulating botanical and pharmaceutical nanoproducts. “We are rigorously testing these products ourselves before we include them in our database,” a lead scientist at PEN tells Nanowerk. PEN has invited Nanowerk staff to participate in some of these highly scientific tests and we will report about the results in an upcoming Nanowerk Spotlight (tentatively titled “The highs and lows of nanotechnology”). Not to be outdone, the Institute for Cool Nanotechnology (ICON) has convened an international group to assess cultural impacts of splifferene-based materials and products. A two-day workshop in May is designed to engage an international, multidisciplinary group of experts in developing a framework for understanding the interactions of splifferenes with various sectors of society. Prior workshops focused on predicting health-related impacts; this workshop emphasizes the tools and practices needed to assess the hipness factor for splifferene-based products. In conjunction with the workshop, ICON is also sponsoring a product testing. The impact of this discovery on the existing market for diet products, a global $35 billion industry in the United States alone, could be devastating. Not surprisingly, industry associations and spokes persons for the large manufacturers are up in arms. Already, giving in to enormous pressure from lobbyists, a group of law makers from both parties are drafting a resolution that would make Royal Spliffmeister products illegal to sell or possess anywhere in the United States. An exception for medical reasons is likely to be included. Representatives of some of the large food manufacturers are less pessimistic, though. One industry source, who spoke to Nanowerk on conditions of total anonymity, actually was very enthusiastic about this new research. While we here at Nanowerk usually shy away from commercial predictions and reporting on often wacky so-called nanotechnology products, we totally buy into the bright future for splifferenes. As a matter of fact, the Royal Spliffmeister will be the winner of Nanowerk’s first “Nanotechnology Product of the Year” award, to be launched later this year.